Do Hypoallergenic Dog Breeds Really Exist? How are Hypoallergenic Dogs Special? 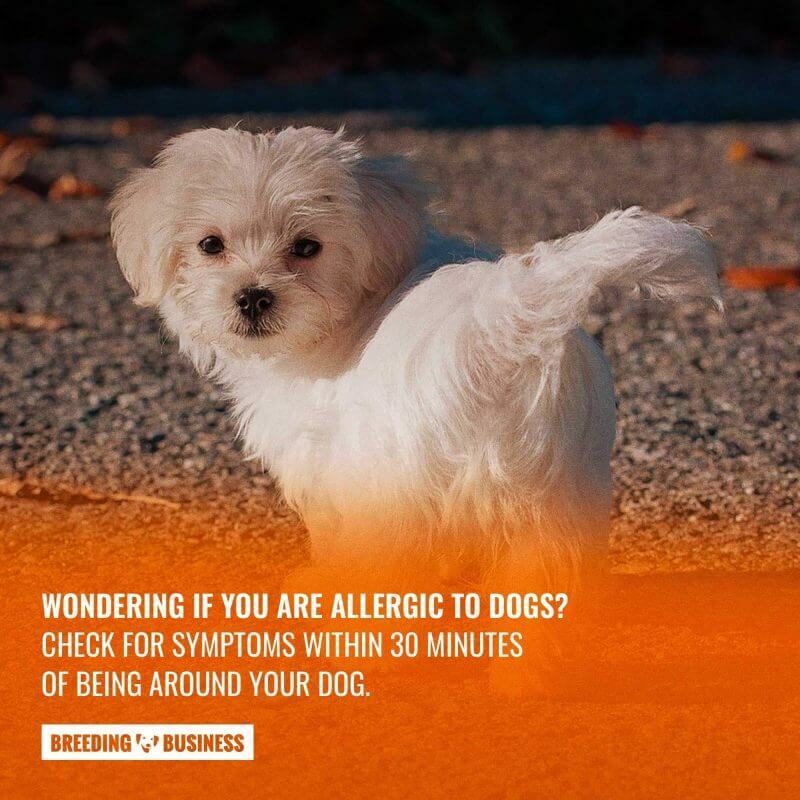 Are you Allergic to your Dog? What dogs are good for asthma patients? How to stay away from allergies when having a pet? What is the best dog for a child with allergies? What dog breeds cause the most allergies? How to eradicate pet allergies from home? 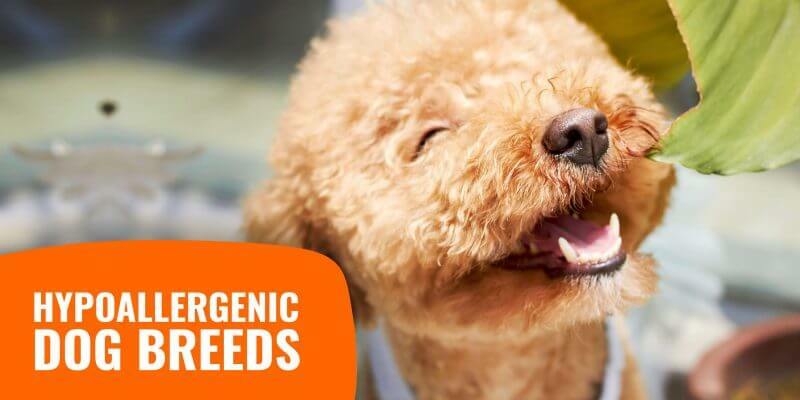 Hypoallergenic dog breeds are the answer to your woes if you’re a dog lover with pet allergies! You may love all kinds of dogs but the moment you come near one, your throat is itchy, your nose is runny, and your eyes are watery. You’re allergic to the one creature you absolutely adore! If that’s not sad, we don’t know what is. But this doesn’t mean the end of your dog dreams at all! Hypoallergenic breeds are dogs that work well with people who are allergic to dogs. More often than not, pet owners don’t even realize they are allergic until it is too late. This could be traumatic for both the pet and the human. For those who refuse to give up their dogs even then, life can become a little difficult as bathing the dog, brushing it and maintaining extra hygiene in the house becomes crucial and frequent. Pet owners may need to identify a dog-free zone within their homes to be able to recuperate at times. If budget permits, hiring a caretaker for the dog would also be recommended, in extreme cases. This is where allergy-free dog breeds came into the picture. Veterinary doctors, researches, biologists, and pulmonologists across the globe are divided on whether hypoallergenic dogs actually exist. Some experts believe it is just another fad and a way to earn money by marketing them to allergic people. The fact is that every dog secretes protein. Pet hair and dander are mere carriers for the secretions. Therefore, how much hair a dog has becomes irrelevant. This is because even a hairless dog will produce proteins and instead of the hair, they will be carried into a human through dander or even touch. The dander can remain airborne for days and stick to carpets and furniture as well. they were smaller in size. Hypoallergenic dog breeds are smaller in size and shed less hair, therefore the chances of their secretions entering a human system are lesser. Hypoallergenic dog breeds are compatible with allergic humans because humans with these allergies have a sensitive immune system. This makes them react abnormally to the proteins that some animals secrete. As such, these secretions are completely harmless for people with normal immunity. These secretions tend to stick to pet hair, saliva and dander and via these, enter the human body. This is when a weak immune system goes for a toss, causing allergic reactions. 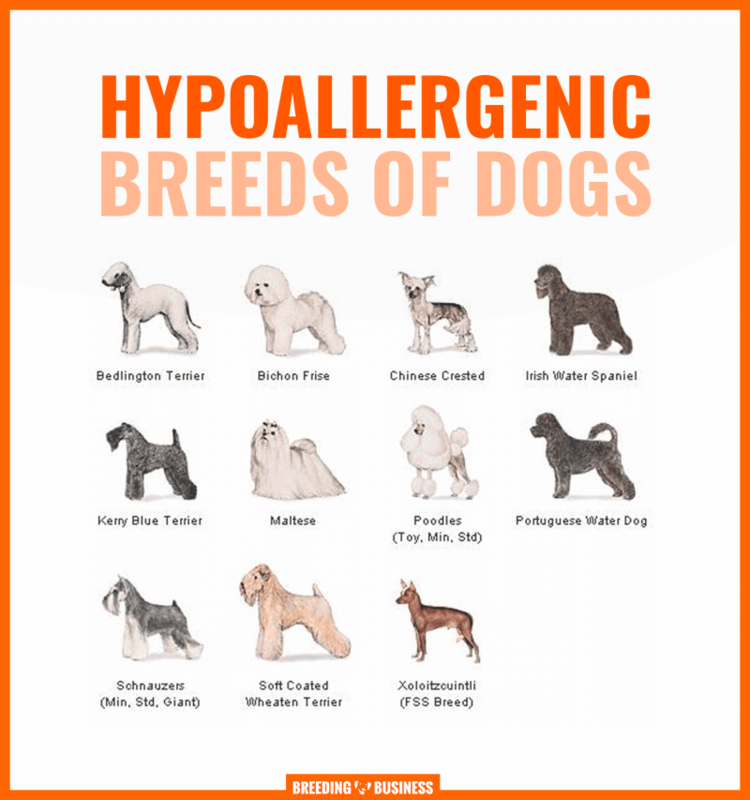 Another interesting finding was that for every allergic person, there is a chance of there being one perfectly hypoallergenic dog – not even breed – but one dog. Some humans showed more tolerance towards a particular dog, as compared to another from the same breed. This happens because each dog also secretes protein uniquely. This means, finding the perfect dog could just be as tough as finding a soulmate – and just as worthwhile too! it may also set off an attack in asthmatic patients. 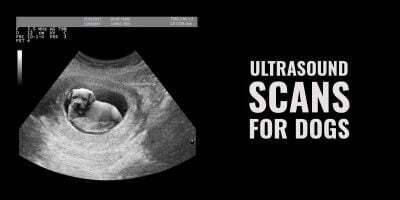 You may feel as if your insides are being razed by something sharp. Some people also experience reactions on the skin such as immediate breakouts where the dog has licked or touched, rashes and even hives. To be 100% sure of whether these are because of your pet, doctors may recommend skin or blood tests. Usually, non-prescriptive allergy tests are inconclusive when it comes to pet allergies, so trust your doctor. For milder allergies, you could simply try staying away from your dog for a few days and observing these symptoms. A bunch of pet allergy tests exists to check if you are allergic to dogs. Hypoallergenic dog breeds could be purebred or crossbred. If you’re allergic to dogs and are looking to get one, there are a few things you must consider beforehand. Like the area of your house, the frequency of cleaning the house, how often do you have help around the house and how bad are your symptoms. 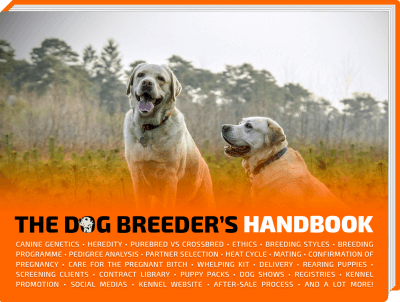 All of this must be factored in to determine the best suitable breed for you. Nothing exudes snobbishness as poodles do and yet they are adorable and highly intelligent. Plus you have a choice as they come in 3 sizes – toy, miniature & standard. Not only are they super cute, but poodles can also be great companions for sensitive humans because their dander and dead hair get caught in the tightly curled fur that covers their body. Moreover, their hair follicles have a longer shelf life, which makes poodles, very occasional hair shedders. However, this breed requires frequent bathing and brushing, to maintain their fur and keep them looking sharp. So be prepared to work hard if you’re getting one! One look at them could melt your soul – it is hard to imagine that these cloudy balls of fluff were used to catch rodents in Medieval times. Today the Maltese Terriers make for great hypoallergenic pets owing to the fact that they don’t shed their fur at all. They are bright and active and very warm. Pet owners who prefer their hair short need to ‘puppy trims’ for this breed. However, their gorgeous long silky coat requires frequent grooming and washing. This is a plus too, as such high maintenance minimizes any chance of dander around the house. The name literally translates to “curly lap dog” in French and when you look at them, you’ll realize how aptly they’ve been names. You want to snuggle these fur balls and the good thing is that you can! Even if you’re allergic! Their mated, tangled curls make it impossible for dander to escape into the environment while minimizing hair shedding. However, these are extremely high maintenance dogs – so either you should hire a caretaker or be prepared to have a full-time job as a dog groomer yourself. This breed is also prone to skin conditions, so you have to be extra cautious with their health. They are amongst the most expensive dog breeds, too. Crossbred in Australia, the Labradoodle is a mix of a Labrador and a Standard Poodle and exhibits the qualities of both very well. Friendly and warm, these are being preferred as family dogs. Low-shedding is what makes this breed a good choice for allergic people. However, one must ensure that the parents of the pup you are getting also had low-shedding coats. As it is a crossbreed, it can be temperamental and demand a lot of patience and flexibility from its humans. This breed is prone to a lot of health issues also owing to its crossbred lineage. A strong and reliable companion, the Portuguese Water Dog does not shed much and so is a good choice for someone who is mildly sensitive. If you are highly allergic to dogs, it is best to consult a doctor and then go ahead. 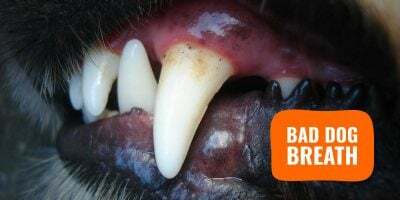 While these canines can be fiercely loyal, they are prone to a horde of genetic health issues like hip dysplasia and cataract, thus demanding as much loyalty from the humans in return. Don’t get this breed if you’re not prepared to care for the dog in its later life. This pure breed from Ireland has a matted soft coat that needs frequent grooming. However, they rarely shed hair and are also great as therapy pets. While its long coat comes in two types – American which is thicker and Irish which is silky – both can get really dirty owing to the matted curls. They make for excellent family pets because they are warm and welcoming towards people and show little to no aggression. The downside is that in spite of their warmth, they are stubborn and slightly more difficult to train than other dogs. Also known by many other names like the Chinese Ship Dog or Chinese hairless dog, this is a toy breed. There are two varieties – powderpuff, which comes with a soft double coat and hairless, which as the name suggests has a coat akin to human skin. They are friendly but high maintenance and the hairless variety is prone to acne and sunburns just like humans. This breed may be inadvisable to highly sensitive individuals due to direct skin contact. However, if maintained well, they can be a good hypoallergenic breed owing to their small size. Giant Schnauzers make for great hunting and family pets as well as good watchdogs. They are proof that even hairy dogs can be hypoallergenic. This adorable crossbreed of a Schnauzer and black Great Danes has a non-shedding coat and is not very high maintenance either and requires minimal brushing and regular grooming. Originally created to work as farm dogs, they are a popular family pet breed today and are excellent around children too. Their low aggression, fierce loyalty, patience, and protective nature make them good babysitters. However, Giant Schnauzers require an area big enough to roam freely. Uniquely attractive and exuding warmth, Afghan Hounds are the fashionistas of the dog world. With their thin dramatic features and thin fashion-model structure, they stand out. As the name suggests, these purebred dogs hail from Afghanistan where they are colloquially called Tazis. They have made quite a few appearances as fictional characters in Disney movies. A happy breed for families, these are low shedders and therefore a good pick for allergic people. Afghan Hounds are usually high maintenance and need frequent grooming and regular exercising. Even though they aren’t as big, they still require enough space to be able to walk around freely. A delightful little breed that is covered in a gorgeous blue-grey curly coat, the Kerry Blue Terriers make for great family pets. They are low dander dogs with matted curls that disallow allergens to escape. This makes them good dogs for allergic people and they can even live peacefully with asthma patients. This breed does require constant grooming to detangle their hair and prevent matting. This is an important part of keeping the Kerry Blue Terrier as a pet because severe matting cannot only be traumatic to the dog and the owner, it could also result in hair breakage, causing allergens to float into the environment. A list of small hypoallergenic dog breeds. Because a lot of people have mild allergic reactions to cats and dogs, a lot of future pet parents or current dog owners have questions pertaining to allergy-free dog breeds. We have tried to answer them as concisely and precisely as possible below. Poodles, Portuguese Water Dogs, Schnauzers, Shih Tzu, Bichon Frise, and Kerry Blue Terrier are breeds you can consider. However, you must keep some dog-free zones around the house as no dog is 100% hypoallergenic. Dogs with low dander and low hair shedding are good options for any person prone to pet allergies. Strictly pet the dogs and let them lick you only after they have been bathed and brushed to minimize allergens. Obviously, identifying dog-free zones is a must when you have pets. Especially areas like the kitchen and the bedroom should be no-entry for your pets, no matter how much you love them. Kerry Blue Terriers are the top match – they are warm, sprightly and patient. Giant Schnauzers are also recommended for children – they are loyal and completely trustworthy with almost nil aggression despite their impressive sizeable presence. 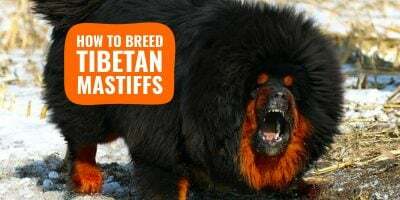 These breeds also have traits of being overprotective about their humans, making them good guard dogs and watchdogs for the kids, while being hypoallergenic too. Both the Kerry Blue Terrier and the Giant Schnauzer are crossbred with low dander and hair shedding. Both are equally low maintenance also – which works in favor of working parents with allergic kids. You already have a lot on hand, so the pet won’t be an extra chore for you. Basset Hounds – they drool a lot and can sometimes have low control over their bladder, causing allergens to stick onto the house through saliva and urine. Dachshunds – Dachshunds are proof that not all hairless dogs are hypoallergenic. In fact, hair has nothing to do with allergies except act as a carrier. Dachshunds tend to shed a lot of dander causing allergens to float in the air. Saint Bernard, Labradors, Golden Retrievers, Cocker Spaniels – These dog breeds are a no-no for allergic people, all for the same reason, that they shed a considerable amount of hair, are prone to dandruff and drool a lot. This releases a lot of allergens. Siberian Husky – Huskies have a thick double coat that they shed twice a year resulting in a lot of pet hair. The dander sticks to the hair and can cause allergies. Boxers and Bull Dogs – Yet another short-haired breed that is not good for allergies. Both these breeds shed their short hair in copious quantities. They also drool a lot. German Shepherds – While excellent as pets, German Shepherds shed their thick furry coat all through the year. They are also prone to a lot of dander shedding, making them detrimental to those who suffer from allergies. Cleaning the house isn’t a chore if you’re an allergic pet owner – it is a compulsion. Allergens can remain airborne and even accumulate on upholstery, tapestry, carpets and even solid surfaces via pet hair, dander etc. If your dog tends to drool, you have an uphill task. Vacuum clean the house every day to get rid of any pet hair and dry skin that may have stuck to your linen and tapestry. Solid surfaces can be wiped with a wet rag. Make your laundry area a dog free zone and make sure that you dust your clothes clean before you throw them in the wash. Use a sticky lint roller to get the hair out of your clothes if you must. Ideally your bedroom should be a dog free zone, but in any case, cover your bedding with a bed cover or plastic so that none of the allergens stick to your bed. Failing to do so could give you multiple sleepless nights and disturb your sleep pattern. A good air purifier will rid the air within the house of any potential allergens that can cause you discomfort. Easily available online, allergen sprays work on dust mites, mold, pet dander, pollen and eliminate all kinds of allergens from the environment. It is highly recommended for people with allergies but even those who don’t have allergies can use these to get a better breathing environment. Regularly bathing, grooming and brushing your pet can minimize allergens, making the home habitable for allergic people. Use good quality shampoo to reduce hair and dander shedding.